Yet another new hipsters café arrived in town and this time it is in Sunway city of Tambun Ipoh. Too much of new comers in this so called “hipster’s café” at the same time makes me hard to choose which one shall I review first. After Thumbs Café, Al-Negra, Mat Periuk, another new (well not really new since I’m quite late in writing this, but yeah~) art café in Ipoh town has arrived, Gomok Café. I’m not really sure why they choose the name, but most probably it is relatable to the word “Gemuk” which means fat. I really happy to see many cafes of this type started to came into pictures because as I said it before, I really love to see Ipoh as a small town that focusing on arts tourism. 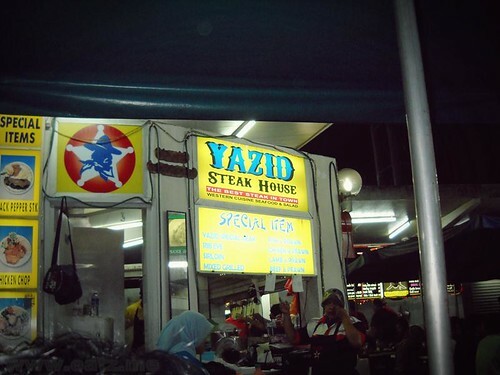 Yazid Steak House @ Damansara Uptown, Damansara Utama (SS21). Anyway, I quite like this stall foods because of it’s uniqueness. The taste also not bad. But there are lack of seats here, sometimes on the weekends, it was hard to find a table. Maybe because there are 2 good steak stall here. Because this stall is near to Lanun or Pirate Steakhouse, another favourable steakhouse here in Damansara Uptown. But I may review about it later. So here is my conclusion on this stall. Food: Nice, Unique and Tasty~Me likey~I prefer grilled Chicken Chop rather that being deep fried. Environment: Open food court, Comfortable, but sometimes when you come in weekend it was hard to find a sit. But they used “free seats” here, means you can seat anywhere and order on any stall. Price: Very reasonable for a price of western dishes. Most of the price is below RM10. Restoran Nasi Lemak Ayam Kampung @ Jalan Ali Pitchay, Ipoh. or in English, Nasi Lemak Ayam Kampung Restaurant @ Ali Pitchay Road, Ipoh Perak. Ok this time I want to blog to you about one more good food in Ipoh for you to try. Ipoh is the hometown of Perak. It has a lot of good food for the food-lovers to explore. I was unable to explore all the good halal food here, but someday will do it, InsyaAllah. Anyway, for this restaurant, I really impressed with the variety of the food available. If you look at the menu, there are plenty of food to try for, from Local to Western food. 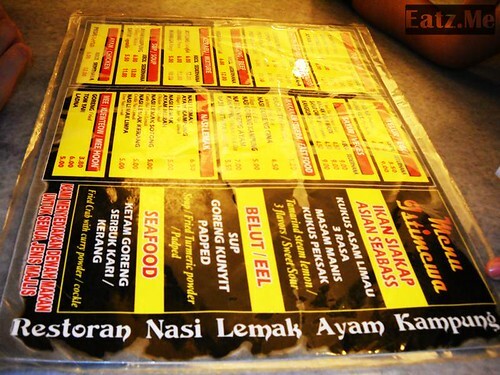 But the signature dish of this Restaurant is Nasi Lemak Ayam Kampung, as it’s name. So, I come here to taste how good it is. Before that, for you who don’t know what is Ayam Kampung is, literally it means “Village Chicken” but the terms is use for the chicken which is not breed in a farm, where it had been given some antidote or some scientific medication. Ayam Kampung will stay virgin and natural without any modern injection or medication. Food: Sorry to say it, I think the Nasi Lemak was not good enough to impress me. But not the Ayam Kampung. I really don’t know the real taste of Ayam Kampung, so for me it’s was just OKAY, not more nor less. I’ve go for better Nasi Lemak before, so this restaurant in not meeting my standard. However, remember this, this is merely my personal opinion about the Nasi Lemak Ayam Kampung menu, so don’t trust me too much, I’m not a professional food taster anyway. And, I did think the other food in this restaurant is quite amazing. For example the Eel Soup, Chicken Chop (quite good) and Nasi Goreng Kampung. The Menu here are quite big, so there are plenty of choices you could try. There are also some Bubur Manis (Sweet Porridge) and Seafood. Environment: I WOWed at this restaurant environment. It was big and comfortable. And it’s air-conditioned, but you may choose to go for open air in front of the restaurant. Price: It’s a bit pricey for the Ipohrians I guess? But this time I’m not very sure, you’lll need to go yourself and decide ok? To me, the Nasi Lemak Ayam Kampung is a bit pricey, but maybe because it’s using Ayam Kampung. – It’s only open from 4.30pm till 2.00am only. So you will only able to go for dinner and supper only. – This restaurant is located at Jalan Yang Kalsom, near the famous Nasi Vanggey and Nasi Ganja stall. Anyway, enough talk, enjoy the picture taken after the break.